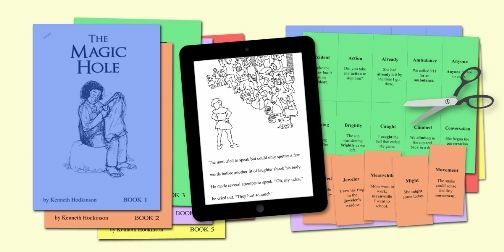 I was happy to get a chance to review a set of six reading adventures geared toward 2nd and 3rd grade readers with The Magic Stories, from Allsaid & Dunn, LLC, publishers of The Reading Game and authors of the Wordly Wise series. 25% off with the coupon code "raisingreaders"
The Magic Stories is a follow up to The Reading Game, though your child does not have to have used The Reading Game to enjoy this program. 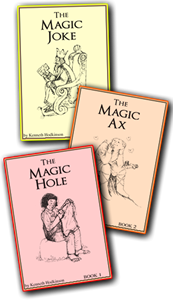 The Magic Stories are downloadable pdf format, optimized for iPad or computer and can also be printed. The stories are intended to build confidence and strong comprehension and creative writing skills while tracking your child's progress with the free running record sheets or classroom class-recording sheets. 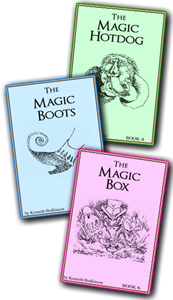 The Magic Stories is a set of six stories directed toward children in the 2nd or 3rd grade or struggling readers who read at or about that level. Each story is fun to read and offers a moral. The Magic Hole - Ping Ho finds a bag with a magic hole which changes her family's life. They also come with their own set of "Naughty 40 words" to be printed out on 4 sheets of paper or card stock and cut into flash cards. Don't worry! These naughty words are merely words that readers typically struggle with and are intended to be used as a list to review before each story to gain confidence when the child encounters them while reading. Additionally, the child can color the illustrations within the story. I was not familiar with, nor had I used the Reading Game (though, after looking it over, I wish I had known about it when my children were learning to read). But, I had no trouble picking up with The Magic Stories without ever using the Reading Game. The two are separate and can easily be used individually. 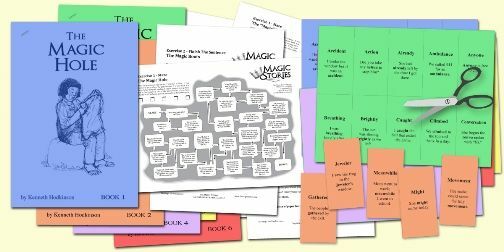 I downloaded The Magic Stories cards and exercises to use with my 11-year-old daughter. 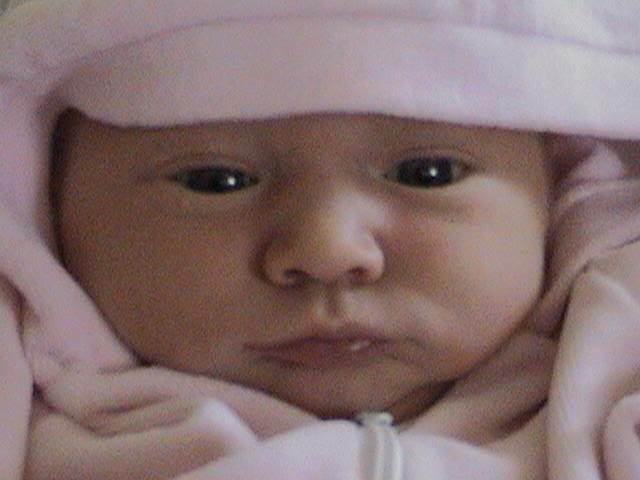 Her reading level, however, was last tested at about 3rd grade level, so I figure any help I can get with interesting her in reading is welcome. You can print any or all of the program or use any or all of the program onscreen, with the exception of the Naughty 40 cards. They are flash cards, so are intended to be used as such. I chose to read the stories onscreen and only printed out the exercises and cards we wanted to use in a more hands-on manner. I love how The Magic Stories make reading a fun activity rather than just a list of reading comprehension questions. 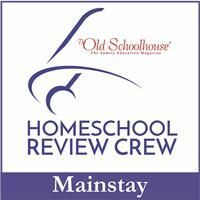 I tend to steer away from mystical magic or "naughty" things in my homeschool, so I first reviewed the stories before handing them over to my daughter. What I discovered is that the stories are some, or similar to some, I remember from childhood using magic only as a way to express the moral of the story. I found that the "Naughty" words are used to pique your child's interest, as the Naughty 40 are simply words children tend to struggle with - not bad words as you may think when you first see the term. 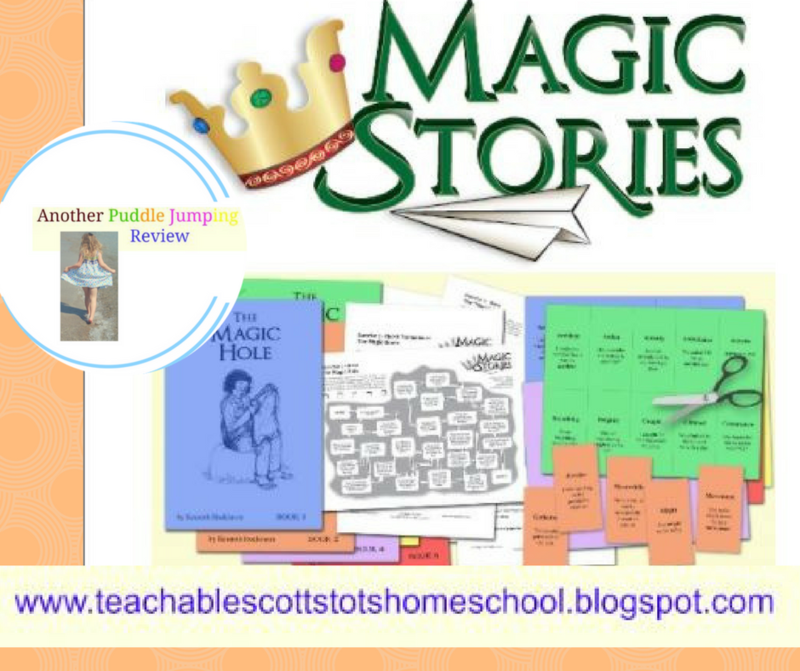 Overall, I love the concept of how The Magic Stories works using the 40 words to study first which gives the child confidence before tackling the story. The print size of the stories is perfect for this level of reading, and we especially enjoyed the mazes that followed up each story.